I have to be honest, this dress isn't very 'me' and I'm still not 100% sure about it but my mum and sister assured me it looked lovely in the Primark fitting rooms so I thought 'what the hell' and bought it. I'm hoping I'll get lots of wear out of it in the S/S as its very pretty and the shape is very flattering too - it definitely enchances my best bits! I think its the bold floral pattern and neckline I'm unsure of - its very 1950's and I'm worried it may make me look a tad frumpy. Maybe I'll have to make it a bit more edgy with a leather jacket and some ankle boots! In my opinion, you can't beat a t-shirt. They're a wardrobe staple and so convenient to have to throw on with a pair of jeans. I'm actually wearing this one from River Island as I write this post and I absolutely love the burn out fabric and LA print. 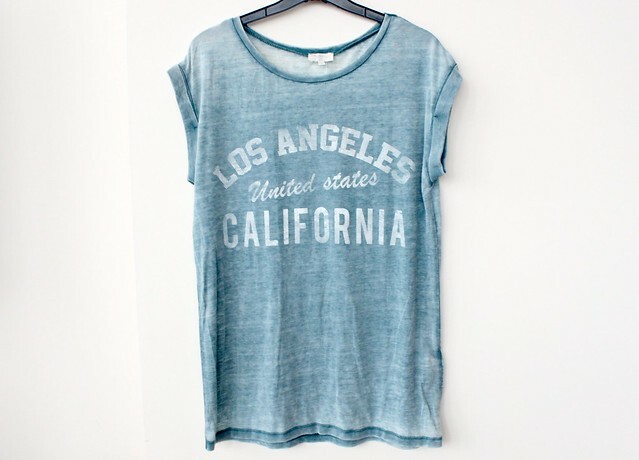 I think this will look lovely in Summer with some sandals, sunnies and acid wash denim shorts. 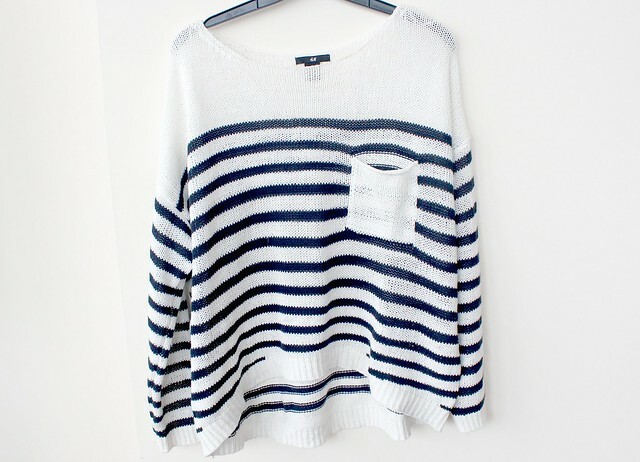 Another H&M bargain I just couldn't resist is this cute navy and white stripey jumper which was only £14.99. I've already worn this and had lots of compliments on it. Its such an easy one to thow on with a pair of jeans and will be nice to wear on those breezy Summer evenings. When I spotted this blouse for only £7.99, I just couldn't resist buying it. Its one of those perfect wardrobe staples that can be worn in so many different ways and the light material means it'll be perfect in S/S. My initial thought was to wear this with some skinny jeans and wedges or tucked into some denim shorts but since buying some navy shorts from River Island (more about those below) I'm now planning on wearing it with those too! I think these shorts from River Island are my favourite clothing purchase in a long time. 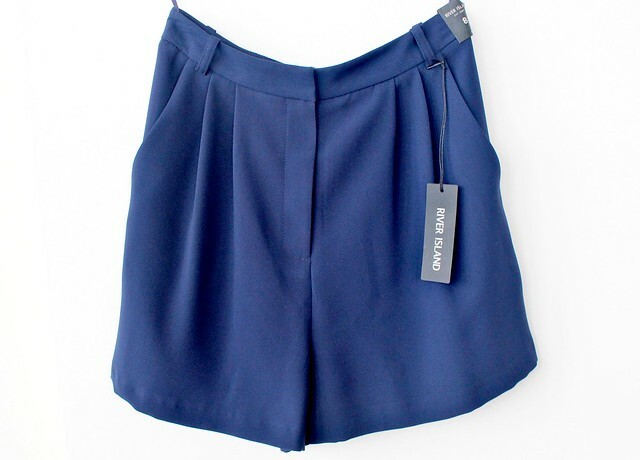 I've been wanting to get my mitts on some navy high waisted shorts for ages after seeing Mollie King rocking a pair and loving how they looked. I think they look so lovely with a blouse or vest tucked in and these ones I spotted in RI fit me like a glove and really flatter my body type. They did come with a black and gold belt but it didn't match at all so I took it off and plan on wearing them with a thin tan waist belt instead. I've alreay got so many outfits in mind I can wear with these - I just need the nice weather now! 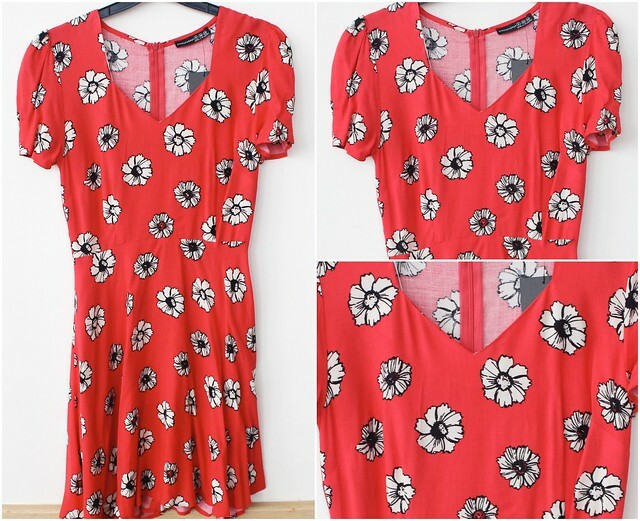 I spotted this on the New Look website and thought it'd be a lovely dress to wear in Spring with some tan sandals! 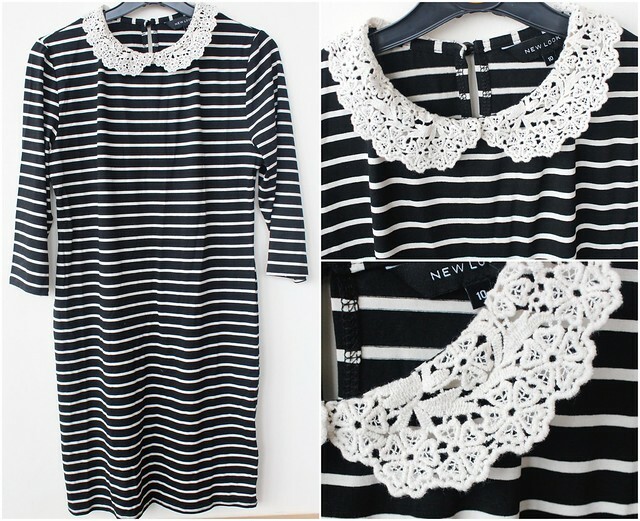 I really love the 3/4 length sleeves, nautical stripes and crochet peter pan collar - too cute! This purchase was influenced entirely by my new River Island shorts which I've spoke about above. As soon as I saw this cami top staring at me from Dorothy Perkins window, I had a bit of a lightbulb moment and thought 'oh, that will look perfect with those shorts I've just bought' and yep, yep it does. It matches the shorts absolutely perfectly and I can't wait to wear them together on a hot Summer's day. As soon as I spotted this on the Miss Selfridge website, I knew I had to have it. 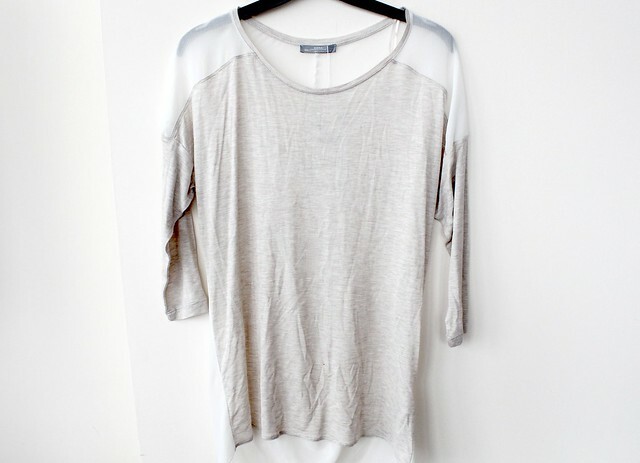 I can imagine this looking perfect on holiday with a tan and a pair of tan wedges. I really love the shape around the neckline too - I have other dresses in a similair style and its a really flattering and feminine shape! Can you tell I've got a thing for stripes at the moment too? I didn't realise how many stripy things I'd bought until typing up this post. Oops! You're probably thinking this looks very similair to the River Island t-shirt above and yes it is similair but as I said earlier, you can't beat a t-shirt and therefore, you can never have too many. I find them so convenient to wear with shorts in Summer so its essential I have a stash of them in my wardrobe! 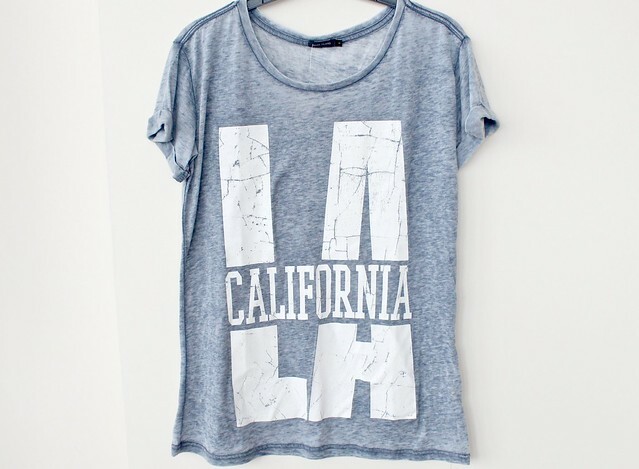 Sticking with the US theme, this one says California and I intend to feel like I'm in California every time I wear it ;). Although I always love the look of Zara clothing on other people, it isn't a shop I buy much from myself. I know, I know, how utterly untrendy of me! Its not that I don't like their clothes, I just never seem to spot anything I like in my local Zara store and anything I do like tends to be way too overpriced. However, I recently spotted this tshirt/blouse thing (its a t-shirt from the front and blouse from the back) and I fell in love with it. 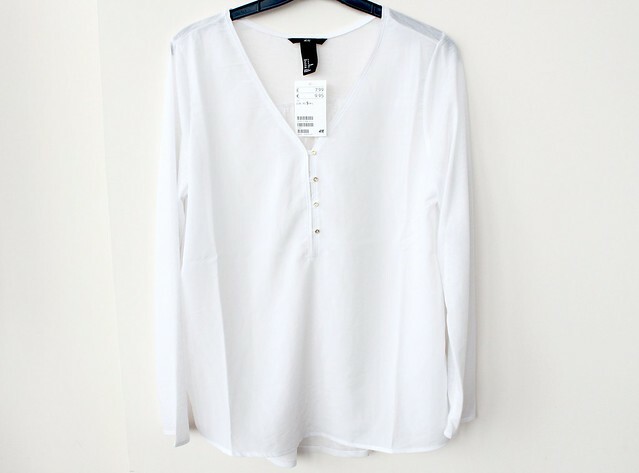 It was only £17.99 so pretty reasonably priced and I think its a great casual piece to throw on with a pair of jeans or shorts and the floaty shape is really flattering too! I must apologise for the creases in this photo - I haven't had chance to give it an iron yet! Okay so this is a little bit of a cheat item as I didn't actually buy this myself and was very kindly sent it from Sugarhill Boutique. However, I wanted to share it regardless as I absolutely LOVE it and can already tell I'm going to wear it to death when the weather warms up. The two-tone style is very flattering and I adore the crochet top and cute little cap sleeves. I also think it will make a lovely Summer work dress! Okay, can we just take a moment to admire these boots please? Seriously, how beautiful are they? 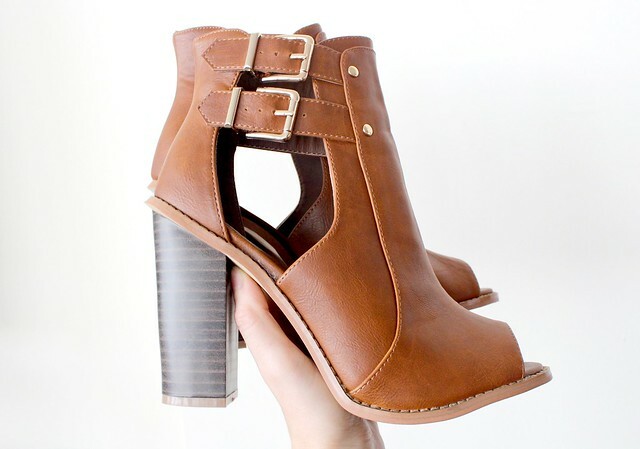 If you hadn't already guessed by all the references in this post, I love wearing tan accessories in the S/S so when I spotted these cut out peep toe boots, they had to be mine. Boots aren't the most obvious choice of footwear for the warmer months but these ones are an exception thanks to the peep toe and cut out style. I think they'll look great with a girly Summer dress to grunge things up a bit! 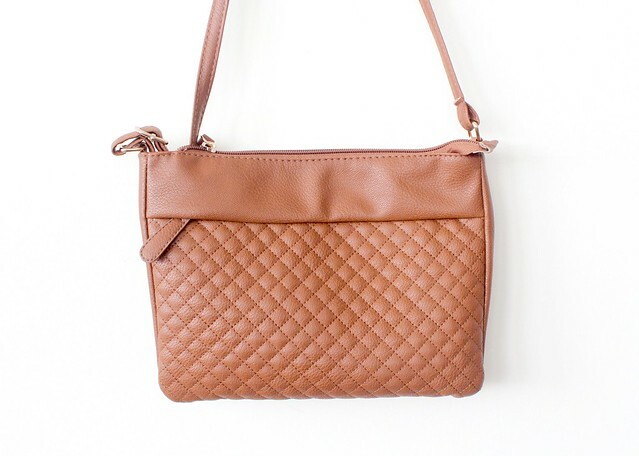 As soon as I spotted this cute quilted bag in Primark for only £4, I HAD to have it. Its the perfect little S/S bag that will go with all of my tan sandals/wedges and it can be worn over the shoulder during the day or as a clutch bag in the evening. You all know how much I love a good versatile item so I imagine I'll get a lot of use out of this one! I've been loving wearing statement rings on my thumb recently so I thought this one from Primark would be a nice addition. 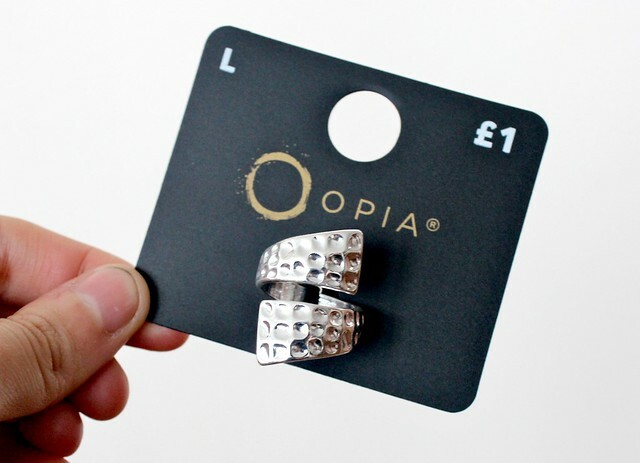 Plus, who can resist a £1 piece of jewellery? So there we have it - all the things I've bought lately! Writing this post has made me realise that I need to lay off the spending for quite some time now and actually attempt to save some money. I've got so much planned this Summer and although I'll have lots of nice clothes to wear, I won't have any money to do anything at this rate! For the rest of this month (at least), I'm officially on a spending ban. Lets see how long this one will last! What do you think of the things I've bought recently? Have you started your S/S shopping? Loved everything you got :) Especially the shoes. The t-shirts look sooo comfy, and I agree that you can't beat t-shirts! That is one nice haul! :) Love that navy stripe H&M jumper and New Look dress - so adorable! You would never believe those boots were primark! They're gorgeous! Omg those boots and bag are such bargains! I want themmmm! I love those shoes, and the white blouse, I have the blouse in black, they are perfect for when the weather warms up. The red dress is absolutely beautiful! Love the shoes!! Great post! I love the shoes! I really want to get similar shoes but they are a bit too high for me. I need to get used to high heals. some such nice bits! those boots are amazing, wouldn't of thought they were from primark! You got some lovely things! I'm trying to scrape a bit of money together to get some Spring clothes - all I have right now is winter jumpers…not good! I love love love the boots from Primark!!!! 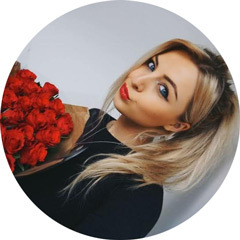 :-) You´re such a lucky girl, good hunt. Those boots are stunning I can't believe they're from primark! I love that penneys floral dress! 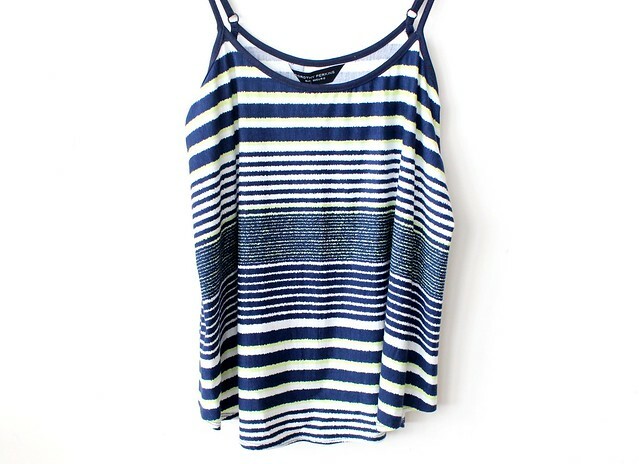 And I have a stripey jumper from h&m its so handy to just thrown on with a pair of jeans, really flattering. Nice haul. I love that stripy jumper from H&M - might have to pick one up myself! I adore those boots! I bet they look amazing on! Some gorgeous pieces, the boots are stunning!! I can't believe those boots are Primark! Everything looks great, I'm into stripes as well at the moment! I love the blouse from H&M and the shorts from River Island. The cami top from DP is gorgeous too. You got so many amazing things. I definitely need to arrange to go spring/summer shopping. I love that stripey jumper you got! i love that brown purse from primark! I wish they had that store in the US! do you know what store is equivalent to it?? Some lovely bits, loving all the stripes! You can't be serious, those shoes CAN'T BE FROM PRIMARK??? My local Primark never have stock like this! Unless I'm just unlucky and miss them! Great haul, I love the RI shorts, they are perfect for the Spring. Lovee the t-shirts and the boots! Love the red dress on, looks great! Love everything you bought! 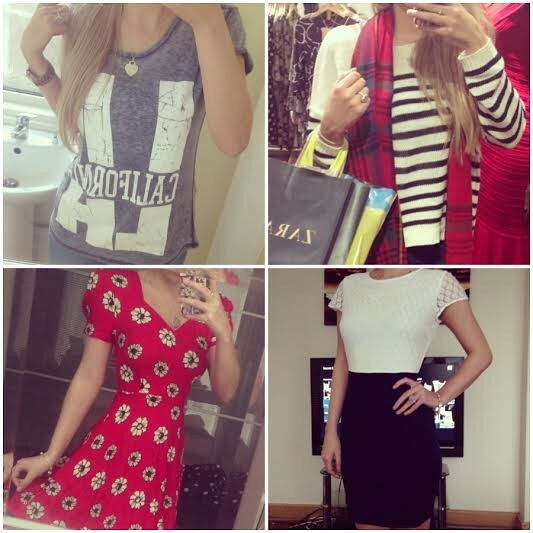 Especially the Miss Selfridge Mini Dress. Those boots are amazing and the dress is so cute! Those boots are amazing for Primark! Those shoes are freaking glorious! Great shop!